The European Literature Network champions international literature – if you aren’t already aware of its activity, do check out its website. Every month, its Riveting Reviews section features reviews of (mainly) European literature – mostly of works recently translated into English. It also offers a Riveting Reads section, consisting of brief (only a few lines long) recommendations of a wider range of books, including fiction and non-fiction not yet available in English translation, as well as texts published years ago. My recent full-length ‘Riveting Review’ was of Antoine Laurain’s ‘Smoking Kills’ (see here). My July ‘Riveting Reads’ are focused on works by Italian authors: ‘The Little Virtues’ by Natalia Ginzburg; ‘Nessuno Puo’ Volare’ by Simonetta Agnello Hornby; and ‘Le 10 Parole Latine che Raccontano il Nostro Mondo’ by Nicola Gardini. I hope you’ll enjoy reading about them and about all the other intriguing titles chosen by my fellow contributors. Image of ‘Riveting Reads’ from the European Literature Network website. Writing as a second career? Following the publication of my debut novel, That Summer in Puglia, I’m regularly asked how I made the transition from a career in management to one in writing. The question may come from a reader at a book signing or in a message via social media; those asking it typically work in a business role and tell me they’ve always loved to write. This post is not an attempt at an exhaustive answer, which would defeat me. Instead, I hope it will provide some helpful points to consider. My reflections have been sparked by a recent event, the Sloan Summit at London Business School to celebrate 50 years of the Sloan MSc Programme there. At the Summit, leadership and change expert Alison Haig-Davies interviewed Gillian Keegan MP and me about our paths to career transformation. Although my fellow-speaker’s activity is not in the arts, the points below about self-knowledge, humility, serendipity, resilience and gratitude were vital to both of us, so I hope they’ll be valuable to others. With writing, are we talking of a career at all? Most published writers do not earn enough from their books for that to be their only activity. Many hold other jobs: as teachers and critics, for example, but also in very different areas. I write literary fiction and for me that has the compelling nature of the vocation. I’m also a literary and opera reviewer, a creative-writing teacher and a board member of an arts festival. Consider what the true constants in your life are: the ones which feel ‘deeply you’. For me these include a combination of artistic creativity and structured thinking, and a lifelong love of the arts. My roles in management involved mostly strategy and organisational behaviour work (both disciplines require more creative thinking than many realise, and lots of writing); and I grew up in a family steeped in the arts (my mother an art historian, my father an art dealer), so they always remained an active passion. I’m one of countless people who have always read voraciously and ‘written well’. But I was conscious that there was much to learn, to be able to write novels: every profession takes years of study and practice. So I started out by attending a no-pressure creative writing course once a week for some months. The feedback was encouraging and I continued drafting short stories and taking part in a writing group. Eventually, I had a portfolio of fiction, on the strength of which I was admitted to the Goldsmiths MA in Creative & Life Writing. I felt that an MA was the most effective way for me to move up the learning curve. At that point I had no expectations about where it would lead – I embarked on it because I really loved writing stories and wanted to be able to communicate what I deeply care about to the best of my ability. I also trusted in the power of serendipity: you do your utmost to be good at what you’ve chosen and when opportunities present themselves you’ll be ready to embrace them. I accepted from the outset that it’s difficult to get traditionally published and that rejections of my manuscript were to be expected in the process of finding ‘a home’ for it – and that it was quite possible it wouldn’t. But even before then – in the course of writing the novel – I had to be open to others’ constructive criticism: being defensive about your work (whatever your field) doesn’t do much to improve it. I also assumed that writing the kind of literary novels I had in mind, and getting published, would take years – and it did. The process I’ve described requires being sustained by others at different junctures and in a variety of ways. I’m sure that writers convinced of their own genius must exist somewhere – lucky them…! Most of us might instead give up along the way, were it not for the belief in us by those whose judgement we trust: in my case, a couple of friends well versed in literature and philosophy, tutors on the MA, fellow MA students… My writing group, composed of other Goldsmiths graduates, has been and is invaluable: we workshop our pieces in an atmosphere of mutual trust, and have become close friends. And what to say of the generosity of the writers and film director who endorsed the novel? And how about the friends and family whose support takes many forms? And the publisher who made the book ‘happen’? And the authors and journalists who compèred the debut events? This might give you a sense of how many people an author is grateful to and for…! At the same time, when you think about it, that holds true for most lives. I hope the sharing of these thoughts will be helpful to you and to others you may know who are considering a new career – whether in writing or in other realms. To you all, my warmest wishes. Images courtesy of Sloan Summit 2018 and Mike Pearce of Mike Pearce Photography. Reproduced with kind permission. My latest piece for The European Literature Network‘s #RivetingReviews is on Antoine Laurain’s “Smoking Kills”, recently translated into English by Louise Rogers-Lalaurie for Gallic Books. This short novel grips the reader with sharp satire and with a plot hovering between the realistic and the hilariously bizarre. French humour noir at its best. I’m grateful to those who hosted a stop on the tour and to their fellow bloggers who made the reviews travel far and fast. Literary bloggers give freely of their time. No-one can mandate their emotional engagement or their final verdict. Their chief motivation? Love of reading, writing, learning and sharing. I’d like to thank them by selecting extracts from their reviews. But first, my thanks to Aimee Coveney and Helen McCusker of Bookollective for organising the tour and to Eyewear for publishing the book. I hope the quotes from the tour will give you a flavour of the novel. You can read additional reviews here. Jo Park kicked off on 17 May by hosting an extract from That Summer in Puglia on her Over the Rainbow Book Blog. A stop with a different blogger followed each day until 27 May. Karen Mace, Books and Me! This review is in video form. “It was Tommaso that stole my heart… Vescina’s writing is brimming full of emotion and tenderness. “As intense as the heat of an Italian summer. […] As Tommaso and Anna roam the maze of narrow streets that make up the Old Town of Ostuni, taking delight in small things and shared places, there are beautiful descriptions of the ancient town, full of light and shade. “The beautiful descriptions transported me straight there, from the olive trees to the scent of the flowers. […] At its heart, That Summer in Puglia is a love story but it’s so much more than that. It’s a relatable character study full of complexities that oozes atmosphere. Hindsight is a wonderful thing. The way we react to certain things in the heat of the moment can have a huge effect. It isn’t until later on, that we maybe think “I could have” or “I shouldn’t have”. As a nineteen year old boy, Tommaso makes some dubious decisions… Did he make the right choices? That’s up to you to find out when you read this novel. The Book Trail also features an interview with me on its Authors on Location section. They’re creating an online guide to the real-life places in the novel, too. Interview topics include: the perfect reader of That Summer in Puglia, books I’m reading, my writing habits, creative inspiration and future plans. Danielle Nolan’s Books, Vertigo & Tea was the final stop on the tour, which it fittingly closed the way it had begun: with another extract from the novel. I love hearing from readers, so do contact me with your personal responses to That Summer in Puglia. The Q&A section of my website contains resources for anyone curious to gain more insight into it. The novel is available in bookshops throughout the UK, as well as online from Amazon and others in the UK and abroad. All other images – all rights reserved. Thank you, Danielle, for hosting me on the final stop of the tour! Thank you, Linda, for hosting me on your fabulous blog for today’s stop on the blog tour of That Summer in Puglia! I’m a hopeless romantic and I love to travel so I’m thrilled to have That Summer in Puglia by Valeria Vescina on my TBR as I have a feeling it’s going to appeal to both aspects very effectively! Today I’m delighted to be celebrating That Summer in Puglia. by bringing you an interview with Valeria conducted by those lovely folk at Bookollective. That Summer in Puglia is available for purchase directly from the publisher, Eyewear Books here and on Amazon. What you see on my blog post are just a couple of excerpts. You can find the full text of the interview by clicking here. 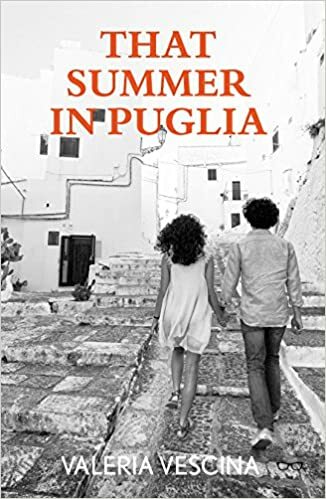 Susan Heads’ enthusiastic review of the novel is here, where you’ll find also an online guide The Book Trail has begun creating to the real-life places in That Summer in Puglia. Excerpts courtesy of The Book Trail. Thank you, Eva Merckx, for your amazing review of That Summer in Puglia! It is my pleasure to welcome you all to my stop on the blog tour for That Summer in Puglia by Valeria Vescina! My thanks to the publisher for my review copy and to Aimee at Bookollective for the invitation to join the tour! Tommaso has escaped discovery for thirty years but a young private investigator, Will, has tracked him down. Tommaso asks him to pretend never to have found him. To persuade Will, Tommaso recounts the story of his life and his great love. In the process, he comes to recognise his true role in the events which unfolded, and the legacy of unresolved grief. Now he’s being presented with a second chance – but is he ready to pay the price it exacts? Thank you, Cathy Johnson, for your detailed, thoughtful review on the What Cathy Read Next book blog. I’m delighted to be hosting today’s stop on the blog tour for That Summer in Puglia by Valeria Vescina and sharing my review of this intense and powerful love story. Thank you to Aimee at Bookollective for inviting me to join the tour. Tommaso has escaped discovery for thirty years but a young private investigator, Will, has tracked him down. Tommaso asks him to pretend never to have found him. To persuade Will, Tommaso recounts the story of his life and his great love. In the process, he comes to recognise his true role in the events which unfolded, and the legacy of unresolved grief. Now he’s being presented with a second chance – but is he ready to pay the price it exacts? Thank you, Amanda Duncan, for your powerful words.